I had a few vegetables to use up and my friend Audrey kindly gave me some courgettes from her garden. I was a bit stuck to think of what I was going to make, but now I am back in soup mode, so I decided to roast the vegetables and turn them into soup. In a large bowl toss together the prepared vegetables, olive oil, salt, pepper and a few basil leaves. Pour the vegetables into a roasting pan, that has heated through in a pre-heated hot oven. Roast for 20 - 30 minutes until the vegetables have started to char at the edges. Turn the vegetables once during this time. Spoon the roast vegetable into a blender, along with the tin of tomatoes and whizz until smooth. Then pour into a pan, add the stock and tomato puree and warm through while stirring. Add a handful of shredded fresh basil and season to taste. This soup is lovely and rich served as it is, but I think it would be even more satisfying with a swirl of cream or yoghurt. It would also be a great pasta sauce. Just think of that roast vegetable and tomato flavour in a thick sauce, coating the pasta and topped with feta cheese. Mmmmmm! It would actually be good with a few reserved roast vegetables added to the sauce at the end for texture as well. If you are making it into a sauce, then use half the quantity of vegetable stock. What a perfect way to use up extra veggies--tomato base makes anything taste great. And I've got some basil that needs picking in my yard! I always tell people, if they don't like vegetables...grill them or roast them. One of my favorite winter soups is similar to this, but it incorporates root vegetables also. It's SO full of flavor, and healthy too. Ooh, this looks delicious! I am definitely going to give this a go. YUM! I feel like soup right now, im so cold! Its like blended ratatouille, yum! I've already eaten dinner ... but this makes me hungry all over again! Yum! Soup looks delicious. I was imagining it over a pasta as well. One question, what is a courgette? Mmm I love pureed soups! I haven't made soup for a few months and am starting to miss it. What a georgous looking tasty soup!! 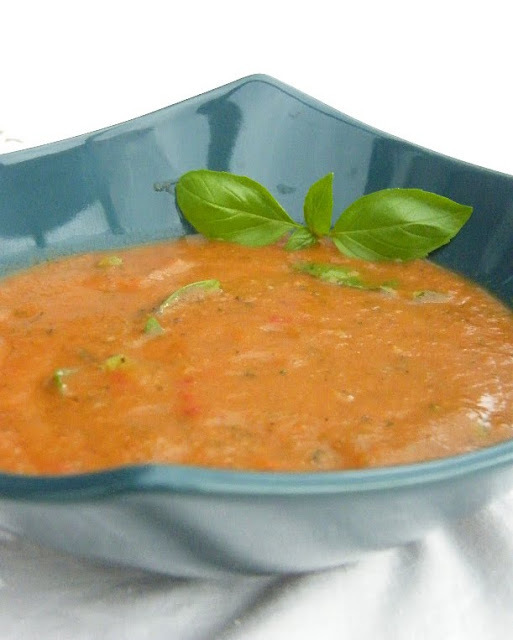 Usually you just see this as a tomato soup, I love the addition of all the other veggies! Basil is my absolute favourite herb so I can relate to this soup Jacqueline. What a great idea! I'm a big fan of vegetable juice... why not use the same concept for tomato soup. This soup is loaded with great stuff! Thanks for all your lovely comments everyone! Sorry I've not been around much. I've been very busy and very tired. Hopefully I will get back on track soon. Oh and hi TB, courgette is another word for zucchini.